ArcPad 7.1 provides a QuickProject template that enables users to get started using ArcPad with minimal effort. 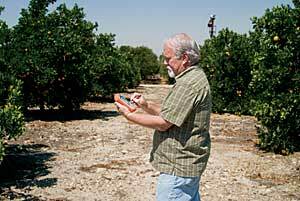 Esri is releasing the next version of ArcPad for mobile GIS and field mapping applications this fall. ArcPad boosts mobile productivity by providing field-based personnel with the ability to capture, store, update, analyze, and display geographic information efficiently. 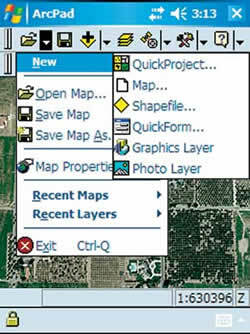 ArcPad also integrates with desktop and server GIS technologies, allowing field edits to be incorporated into a geodatabase through disconnected editing. ArcPad 7.1 and ArcPad Application Builder 7.1 will include new usability and performance enhancements, as well as a number of new features to help users with their data collection activities. For example, at version 7.1, ArcPad introduces a much-anticipated out-of-the-box solution to view and edit features and related tables in the field. ArcPad Application Builder 7.1, the development and customization framework for ArcPad, has also been improved to support related tables, data management tools, and other key features. 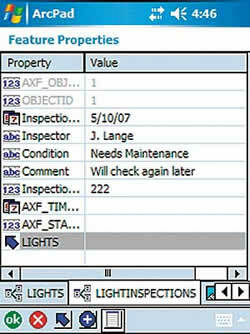 Users now have the ability to view and edit features and related tables in the field. The new capabilities in ArcPad 7.1 will help experienced users, as well as field-workers new to GIS, to become more efficient and effective when capturing data in the field. Together with ArcPad Application Builder, ArcPad 7.1 will continue to provide a flexible and easy-to-use mobile GIS solution. To sign up for the ArcPad 7.1 beta program and provide feedback directly to the ArcPad development team, visit betaweb.esri.com. For more information or to try a fully functional evaluation copy, visit www.esri.com/arcpad.